In SP2010 it's done as the image above is shown, just separate the email-addresses with a semicolon. But in SP2013 I'm not getting this to work, is there a way around this? I need two users to receive the access request emails. In SharePoint 2013 the delimiter changed to comma. If this doesn't work something else is wrong - check ULS log in this case for errors (typo, SMTP error, ...). I know it's not exactly the fix you wanted, but I always recommend access requests go to a shared mailbox, rather than an individual account, as this way: 1. 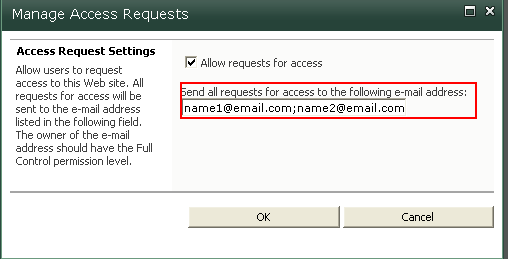 Multiple people can access the requests (as per your requirement) 2. If/when you leave the company/team, you can just give new the person access to that mailbox, and do not have to change all the access request settings in your sites and subsites. Not the answer you're looking for? Browse other questions tagged 2013 email access or ask your own question.